This year marks the diamond jubilee of Queen Elizabeth II and to celebrate, I’ve revived the dish invented to mark her golden jubilee in 2002, ‘Jubilee Chicken’. It was originally served with a pasta salad, but I think my reworked version makes a particularly sumptuous sandwich filling. It’s a mixture of chicken, marinated in ginger, garlic and lime, poached and mixed with a dressing spiked with fresh chilli and coriander. For more on the history of Royal Sandwiches, see this article. Begin by mixing all the marinade ingredients together in a bowl large enough to hold the chicken breasts. Cover the breasts with the marinade and leave for 1-2 hours to let the flavours penetrate. After this time, heat a pan of water and set a steamer over it. Brush any excess marinade off the chicken, place in the steamer and cook for 10-15 minutes, or until cooked through. To make the dressing, mix together the mayonnaise, crème fraiche, red chilli and coriander. Squeeze in a little lime juice, season with salt and pepper then taste and add more lime juice if you think it needs it. Dice the chicken and mix it with the sauce. 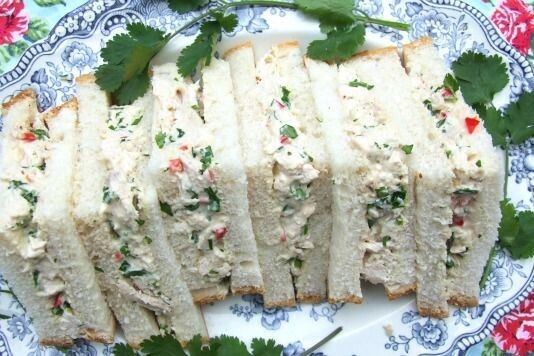 Spread a layer of the chicken mixture on one piece of bread. Top with the other slice of bread and serve, in quarters.